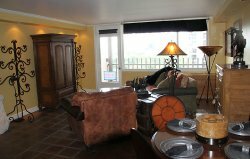 Welcome to the parkcitiesinfo.com Web site! We are here to serve your needs and help you find information about our great community. UNIVERSITY PARK, TEXAS. University Park is on U.S. Highway 75, and Loop 12 five miles north of downtown Dallas in central Dallas County, bordered by the city of Dallas on the north and east and Highland Park to the south. Its name originated because of its location adjacent to Southern Methodist University. SMU officially opened in 1915, and homes were built around the campus to house teachers and staff of the university. Water for the campus came from artesian wells and an overhead storage tank, and sewage lines were connected to Dallas's lines in Oak Lawn. Homes in the area were joined to the university water and sewer lines, and homeowners paid the university for these services. By 1924, with more than 380 homes in the area, the university could no longer afford to supply water and sewer lines to residential areas. The cities of Dallas and Highland Park refused to annex the University Park area because of the financial burden of laying new sewer lines and supplying garbage removal and police and fire protection. Therefore, in 1924 the city of University Park was incorporated with a population of 1,200. The first city government consisted of a mayor and five aldermen, but on April 6, 1926, residents voted to adopt a commission form of city government, which the city still retained in 1992. On August 16, 1924, a $150,000 bond election was held to set up fire protection and to finance water and street improvements. The town organized its own garbage-disposal system in 1925. Snider Plaza, a popular shopping center, opened in 1927, although it remained largely undeveloped throughout the Great Depression. The population of University Park grew rapidly, mirroring the growth of Southern Methodist University and the nearby cities of Dallas and Highland Park. By 1945 University Park had an estimated population of 18,000 and 120 businesses. 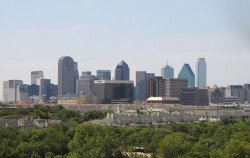 In that year the city of Dallas attempted to annex the cities of Highland Park and University Park, commonly referred to as the Park Cities, but was turned down by a narrow margin. After their refusal of a merger, Dallas used its home rule powers to annex territory adjacent to University Park, cutting off all land for expansion. University Park still relied on the city of Dallas for such services as water and sewage treatment, but in 1947 the Park Cities set up their own Water Control and Improvement District to take over these functions. A water-purification plant, reservoir, and pressure tank were completed in 1950. Because it was surrounded by Dallas, University Park was prevented from annexing land for growth as most communities in Dallas County did, and its area remained 3.7 square miles. Few lots were left vacant on which to build new homes. The population rose from 4,200 in 1930 to 14,458 in 1940 and 23,823 in 1950. Between 1950 and 1990 it fluctuated moderately, reaching an estimated 28,500 in 1956. In that year University Park had eleven churches and seven parks. Its schools formed part of the Highland Park school system, an arrangement still in effect in 1992. The 1990 population of 22,259 was primarily white, 3 percent Hispanic, and 1 percent black. The university remained the largest employer, and businesses continued to be primarily university or student related. HIGHLAND PARK, TEXAS. Highland Park, on State Highway 289 and State Highway 75 four miles north of downtown Dallas in central Dallas County, is a 2.2-square-mile residential "island city" surrounded by Dallas on the south, east, and west and University Park on the north. In 1889 the land was bought by a group of Philadelphia investors, the Philadelphia Place Land Association, for an average price of $377 an acre, or $500,000 total. Henry Exall, acting as agent, intended to develop the land along Turtle Creek as Philadelphia Place, an area of exclusive housing modeled after parkland housing in Philadelphia. He laid out gravel roads and built a dam across Turtle Creek to form Exall Lake before the panic of 1893 destroyed the Dallas land boom and ended the development. Exall lost everything except his horse and some of the land. He subsequently began a breeding farm, Lomo Alto Horse Farm. During the 1890s Exall Lake was a favorite picnic destination for Dallasites. Bass and perch abounded in it, and a steamboat operated on it. Exall bred horses with his stallion Electrite until 1906, when John Armstrong bought the land for a residential development. Armstrong had been a partner of Thomas L. Marsalis in the development of Oak Cliff but sold out to open a meatpacking business. With the sale of his business he invested the money in 1,326 acres of the former Philadelphia Place land to develop under the name Highland Park. Armstrong, along with his sons-in-law Hugh Prather and Edgar Flippen, gave Highland Park its name because of its location on high land overlooking downtown Dallas. The investors hired Wilbur David Cook, a landscape architect of Beverly Hills, California, to design the layout. In addition, George E. Kessler, who designed Fair Park and much of downtown Dallas, was hired to help in planning and development. Twenty percent of the original land was set aside for parks. The first 100-acre addition was begun in 1907 and promoted with the slogan "Beyond the City's Dust and Smoke." Later appeared the slogan "It's Ten Degrees Cooler in Highland Park." The second development in Highland Park, the Lakeside addition, was developed in 1910. In 1913 Highland Park asked Dallas for annexation but was refused. The 500 residents therefore voted to incorporate, on November 29, 1913. The incorporation officially took place in 1915, when the population was 1,100; W. A. Fraser was the first mayor. Highland Park set up its own waterworks, which it operated until 1932. In 1915 the third addition to Highland Park was built, and two years later a fourth. After two years a long annexation controversy began. The city of Dallas regretted its earlier refusal to annex Highland Park and began a battle that lasted until 1945, when Dallas was turned down for the last time. The last major land development in Highland Park, Highland Park West, was built in 1924. In 1931 Highland Park Village, the first shopping center of its type in the United States, was constructed in Highland Park. By 1933 Highland Park had a population of 8,422 and twelve businesses. Its resident population was large, but few businesses and no industry operated in the city. From 1932 to 1950 Highland Park bought water from the city of Dallas, but in 1950 Highland Park and University Park, the "Park Cities," began their own waterworks. In 1949 Highland Park had four elementary schools, a junior high, and a high school. Later the Park Cities combined their school districts, as they did their newspapers. The Park Cities News was established in 1938 and the Park Cities People in 1981. In the late 1950s Highland Park had a population high of 12,900, before beginning its slow decline to its 1990 level of 8,739. After its attempt to annex Highland Park was defeated, Dallas annexed the land around it. Highland Park was forced to grow only by building houses on the few remaining vacant lots, or by tearing down old buildings to construct new ones. In the 1989-90 school year the Highland Park Independent School District had four elementary schools, one middle school, and one high school for its 4,066 students. In 1990 Highland Park had strict zoning ordinances. 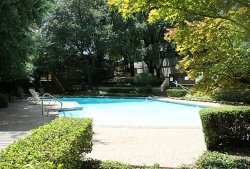 Its reputation for quality housing was enhanced by the abundance of parks running along Turtle Creek and by the Dallas Country Club, which is in Highland Park. Mystery Picture of the Week! Join our weekly contest - we will draw a winner from the first 10 emails that correctly identify our photo. Weekly Contest Entry Form- Click Here! To provide a local news and information channel with access to local, national and international news and offer an opportunity for community members to publish local articles and photographs of interest. Contact Bill Langhenry or Kendall Laughlin at pcinfo@parkcitiesinfo.com for assistance. parkcitiesinfo.com provides news and information about the Park Cities community. If you would like to submit photographs, news items, stories or articles, parkcitiesinfo.com would like to hear from you. You will be requested to sign a release authorizing parkcitiesinfo.com to display your work on the Internet. All content ©2005 parkcitiesinfo.com. Design ©2005 JRichardStevens.com.